Twenty-one people are missing feared dead after heavy rain triggered a landslide which flattened part of a village in Sichuan, southern China. Dozens of houses in Shuanghe village were engulfed early on Tuesday morning after huge amounts of rock and mud slid down Ermanshan Mountain. Police rescued three survivors from the rubble including an 80-year-old, state media reported. Thousands of villagers have been evacuated from their homes. News has also emerged of a bridge collapse in central China on Saturday in which 33 people died. 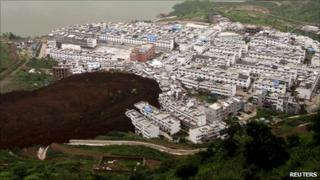 Recent bad weather has killed 1,250 people in China, government officials say. The economic losses across the country are estimated to be more than $22bn (£14bn). China suffers monsoon-type rains every year but this year's rainfall has been the heaviest in more than a decade. Water levels in one tributary of the Yangtze river were reported to be the highest in 30 years at the weekend. Flood waters at the Three Gorges Dam are expected to peak on Wednesday, after torrential rain further up the Yangtze river over the weekend. Since Sunday night, officials at the Three Gorges Dam have been pumping increased amounts of water through the sluices in anticipation of the coming flood. The authorities say it is likely to be slightly smaller than that seen at the dam last week though. In one village in Henan province in central China, 33 bodies have now been recovered after a bridge collapsed. Local government officials say the water in the river under the bridge was usually less than a metre high. But the area had been lashed by the heaviest rain in 100 years. Water levels rose substantially and the river was flowing 63 times faster than normal when the bridge was washed away completely. The accident happened on Saturday but has only just been reported by the national media.